Through your blood, sweat, and tears, she lives in the lap of luxury…the posh life! Some say that she married you for your money; others want to marry you for your money. In your world, nothing is too good for her. Her life is filled with exquisite things. Why would her jewelry be any less? It is said that the smallest things leave the greatest impression…and a great impression is exactly what she found upon her Fortuny Silk Pillows, when she awoke to the sight the Hearts of Hope Jewelry Suite by Chop Zuey. This timeless set features a trio of large Pavé set Diamond Heart shapes, nestled closely together, and fashion unto a bold curb style link neck chain. 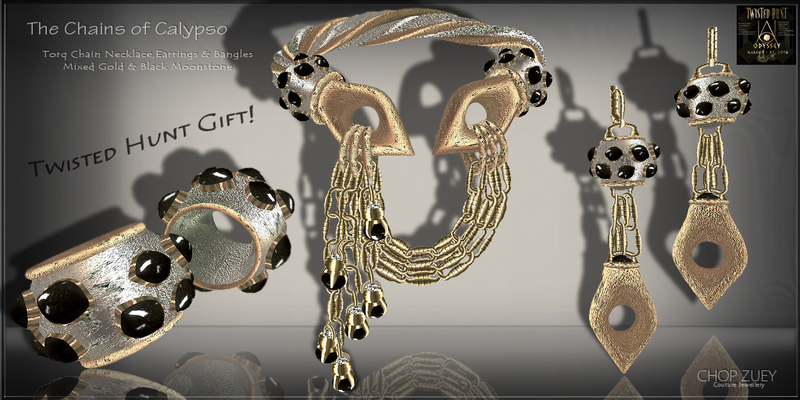 The phenomenal and creative designer, Belle Roussel, single-minded passion for jewels and gemstones along with a great eye for design and detail, dreamed up a pair of sumptuous matching drop style earring, dripping with Pavé Diamonds and a simply gorgeous charm bracelet, that has the tiniest of heart shaped diamonds and plain gold heart charms, adorning the stunning curb style link chain bracelet. This entire set is crafted in the highly desirable Turkish Red Gold. 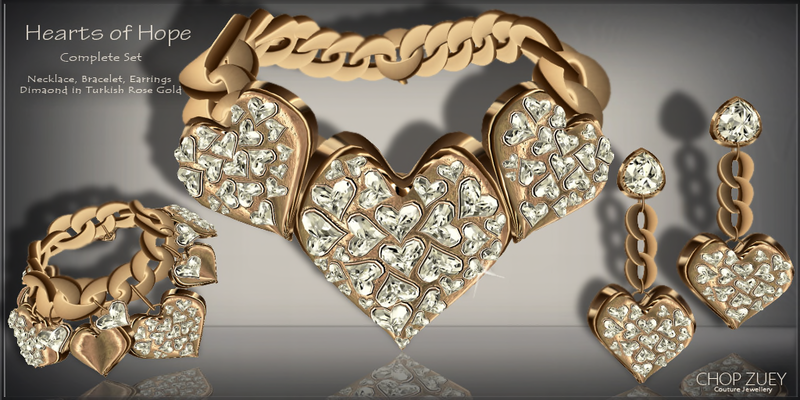 This set more than hints at the opulence that can be yours when you wear Hearts of Hope.